We made a quick stop in Miami so Sue could help at the Miami office for a couple of days Christmas week. Larry and Penny Thompson Park is a county run park near the Miami Zoo. We were a bit skeptical considering the low price and location. It was a very pleasant surprise! Lots of friendly people! And very quiet! This park was set up differently than most. Instead of row after row of RV sites, there was one road down the middle and ‘pods’ – circular areas with the sites spoked out from the center – off of each side. Some of the winter residents would ride their bikes in and around each pod every day – it kind of reminded me of how a polar bear paces his cage in the zoo. We’ve also noticed that half of Florida’s winter RV residents are from Canada. In many parks you can reserve a spot permanently, so large groups come down every year and stay in the same spot, which is cool because you know all of your neighbors just like home. 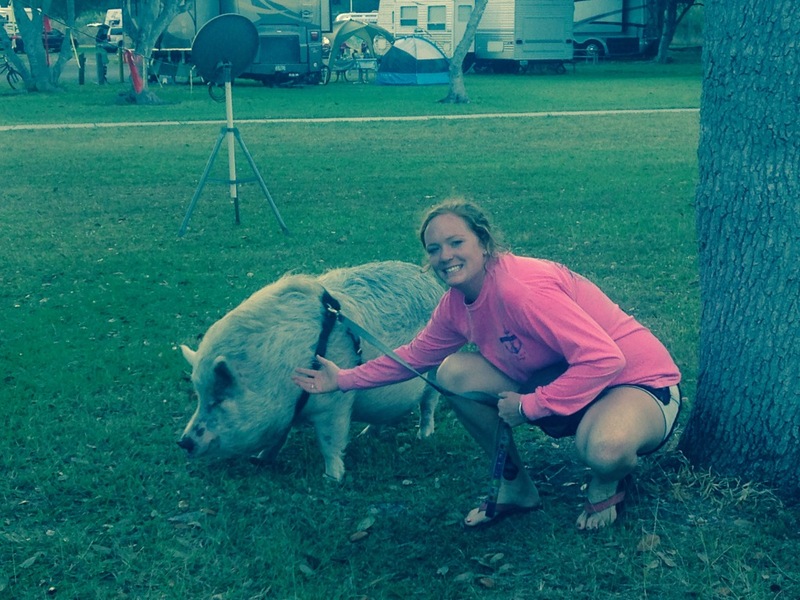 The highlight of the stop was Ziggy, a 250lb pig! He lives with his owners full time in their RV! They had to build a ramp to get him up the stairs and every day they take him out for a walk around the park. Apparently when Ziggy was young, they took him to the Bahamas for a few months due to a contract job. He grew so much that they had to charter a plane to get him back to the states – costing thousands of dollars!! If you look closely at the picture, you will see that Ziggy’s owner is holding a football! Talk about ironic!?! ?